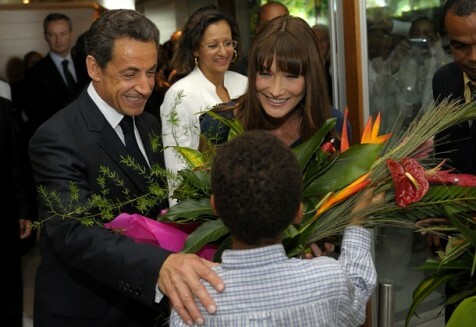 JAPAN, March 31, 2011 (KATAKAMI.COM / KYODO NEWS) — French President Nicolas Sarkozy arrived Thursday in Japan to discuss the drawn-out crisis at the Fukushima Daiichi nuclear power plant with Prime Minister Naoto Kan, as reported by KYODO NEWS AGENCY. Sarkozy became the first foreign leader to visit Japan since the March 11 earthquake and ensuing tsunami that obliterated northeastern coastal towns and ravaged the nuclear facility. He will express his solidarity with Japan, not only as the French leader but also as the chair of the Group of 20 leading industrialized and emerging economies. He is also expected to say that France, which relies on nuclear power for nearly 80 percent of its electricity, is committed to offering more of its expertise to help Japan contain radiation spilling out of the crippled complex, located about 220 kilometers from Tokyo. 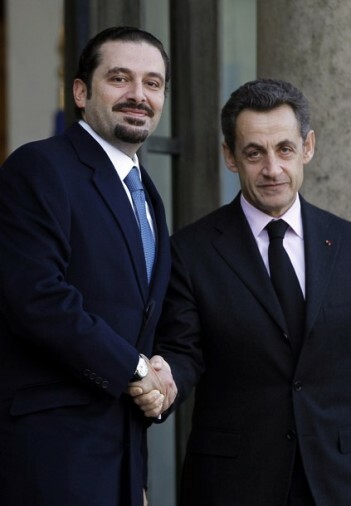 Kan and Sarkozy are scheduled to hold a joint news conference in the early evening shortly after their meeting at the premier’s office. Sarkozy came to Tokyo for a brief visit after taking part in a G-20 seminar on reshaping the global monetary system in the eastern Chinese city of Nanjing. The president, visiting Japan for the second time since taking office in 2007, will head back to France soon after the news conference, according to Japanese officials. France now holds the rotating presidency of the G-20 and Group of Eight major powers, both of which Japan is a member country. France has the second most nuclear power stations of any country after the United States. Japan has the third most, deriving about 30 percent of its power from nuclear reactors. Following the serious accident at the Fukushima plant, nuclear issues will top the agenda at the G-8 summit in late May, when leaders also from Britain, Canada, Germany, Italy, Russia and the United States gather in the northwestern French resort city of Deauville. BEIJING, March 31 (KATAKAMI.COM) — History has repeatedly shown that the use of force is not an answer to problems, but only makes them more complicated, Chinese President Hu Jintao said in Beijing Wednesday in reference to the recent events in Libya, XINHUA reported. “Dialogue and other peaceful means are the ultimate solutions to problems,” Hu said during a meeting with visiting French President Nicolas Sarkozy. The Libyan situation has captured international attention and China is greatly concerned about the situation, Hu said, adding that China believes that the UN Security Council’s resolution on Libya aims to quell violence and protect civilians. “If military action brings disaster to civilians and causes a humanitarian crisis, then it runs counter to the purpose of the UN resolution,” Hu said. “We have noticed that some countries and regional organizations have raised proposals and suggestions in solving the Libya crisis, which did not lack constructive ideas,” Hu said. Hu said China believes it is in the interests of all concerned parties to positively respond to these proposals. Stressing China’s support of political efforts to ease the tension in Libya, Hu said China has called on relevant parties to immediately cease fire, seek peaceful ways to solve problems and avoid more civilian casualties. Hu said China believes that the independence, sovereignty, unification and territorial integrity of a country should be respected and that China is against the use of force in international affairs. 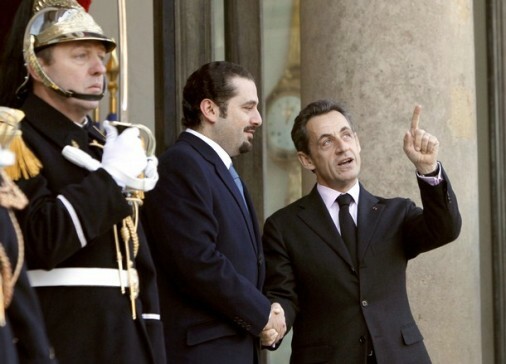 Sarkozy said France also hopes to resolve the Libyan crisis through political and diplomatic means. “As the meeting came on the heels of an international conference on Libya, President Hu took the opportunity of the meeting to elaborate China’s stance on the issue,” said He Wenping, a scholar with the Chinese Academy of Social Sciences. Britain on Tuesday hosted a special international conference to discuss the situation in Libya and launch the political process for the country’s ongoing crisis. Over 40 foreign ministers and representatives from key regional organizations attended the conference. He Wenping said Hu made clear China’s position to the international community and all the African countries. 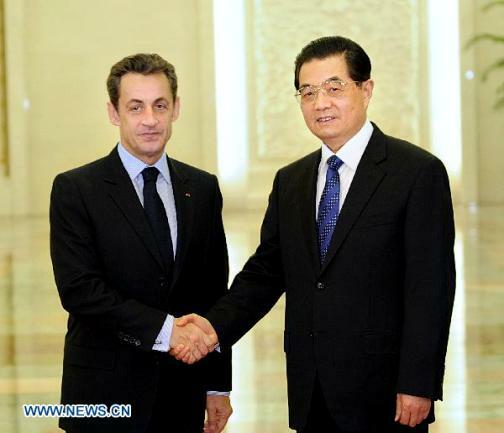 Sarkozy arrived in Beijing Wednesday afternoon. He will attend a seminar on the international monetary system on March 31 in Nanjing, capital of east China’s Jiangsu Province. Sarkozy said France is willing to maintain contact with China in regard to reforming the international monetary system, and is looking forward to President Hu’s attendance at the G20 summit in Cannes later this year. The two leaders also mentioned that this year is important for bilateral relations, and agreed to maintain forward momentum in the development of their relationship. Hu made a state visit to France last year, during which the two sides issued a joint statement on strengthening their comprehensive strategic relationship. During the meeting, Hu said China and France should expand cooperation in burgeoning industries such as new energy, recycling and nuclear safety while deepening cooperation in traditional fields such as trade and economics. Hu added the two countries should enhance two-way investment and cultural exchange. He said the two countries should work to enhance strategic mutual trust, while respecting and accommodating each other’s grave concerns. Sarkozy said the French feel happy that China has become an indispensable force in recent years with its steadily developing economy and growing national strength. 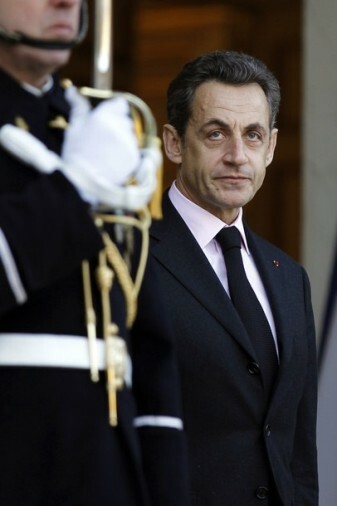 PARIS, Jan 07 (KATAKAMI / VOA) —French President Nicolas Sarkozy made his annual New Year’s address to religious leaders on Friday. In it, he described recent violence against Christians as a “perverse plan of religious cleansing in the Middle East”. He said religious and cultural diversity cannot disappear from the region. A series of violent attacks have hit Christians living in Egypt and Iraq in recent months. In Iraq last October dozens of people were killed during a siege of a Christian church in Baghdad – that was followed by more attacks in December. And in Egypt on New Year’s Day a bomb planted outside a church killed more than 20 people. It was the deadliest attack against Christians in Egypt for decades. Erica Hunter, a Lecturer in Eastern Christianity at Britain’s School of Oriental and African Studies,says attacks against Christians in the Middle East have taken a decisive shift in recent months. “What is new in Iraq and in Egypt is the actual targeting of Christians in churches. Previously there had been many kidnappings, difficulties, murders but we have not seen until October the 31 where worshipers are actually attacked within the churches,” Hunter said. The aim, she says, is to destroy morale within the Christian community. Coptic Christians in Egypt mark Christmas Day on January 7 – later than most Christians around the world. But rather than celebrating on Friday, says Hunter, Christians were mourning the loss of those killed. Hunter says the increase in violence stems from fundamentalist groups. Fiona McCallum from the University of St. Andrews in Scotland, is a specialist on the political role of Christian communities in the Middle East. She says attacks against Christians do not reflect widespread attitudes in the Middle East. 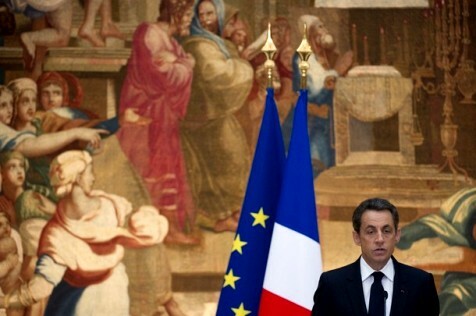 She says to describe the violence, as Mr. Sarkozy has done, as a plan of “religious cleansing” suggests a broad-based persecution that does not exist. But she says attacks are likely to force many Christians to leave their home country. McCallum says in Iraq Christians have already been fleeing the country for many years. The Christian population which once stood at 1.5 million people is now estimated at less than 850,000. She says Christians in Egypt could go the same way. “It’s important to also note that emigration takes place from the region from both Christians and Muslims as well. However, I do think these attacks leave the Christians in the entire region feeling a lot more vulnerable that they are being targeted solely because of their religious identity,” McCallum said.